I discovered the alchemy of baking when I was 6. After diligently petitioning Santa in numerous letters, I received an Easy Bake Oven. When I pulled my first cake out of the pink plastic box, I felt as If I had participated in the birth of something radiant and sacred. A few years later, when I grew tall enough to reach the kitchen counters, I my parents gave me generous freedom in the kitchen and I was soon making full-sized cakes in a full-size oven. When I transitioned to a grain free diet after my autoimmune diagnosis, my love of baking provided a sense of purpose while I struggled with the monotony of a restricted diet. I was called to chase the magic that happened between batter and baked good, and began experimenting with coconut flour. So. much. coconut flour. 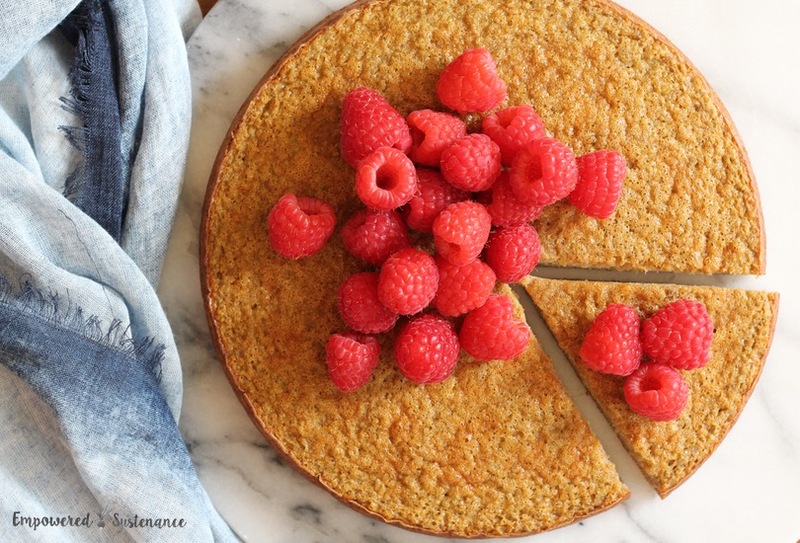 In the process of developing and testing this Flourless Plantain Cake, I felt the familiar fulfillment of baking each time I pulled it from the oven. This recipe is a short-cut to baking magic, because this blender-batter requires mere minutes of prep time. Ripe plantains – As plantains ripen, the peel softens from green to yellow to black. Green plantains have a high starch content, which partially converts into sugar as the plantain ripens. This recipe relies on very ripe plantains – they should be nearly all black, as you can see from the step-by-step photo above. I’ve tested this recipe with plantains in various stages of ripeness, and found that green and yellow plantains resulted in a decidedly dry cake. Eggs – Real eggs uphold the integrity of this cake, and no egg substitute is suitable here. If you cannot tolerate eggs in your diet, there are fortunately many plantain baked goods which can be made without eggs. Baking soda and apple cider vinegar – I use this duo in my baking recipes, as it provides a leavening agent that stands up to the denser quality of grain-free baked goods. Additionally, it allows me to bypass baking powder, which often contains cornstarch (an ingredient I avoid). Vanilla extract – Vanilla highlights the natural sweetness of the plantains. If you prefer, use 1/2 teaspoon of cinnamon instead or in addition to the vanilla for a different flavor profile. 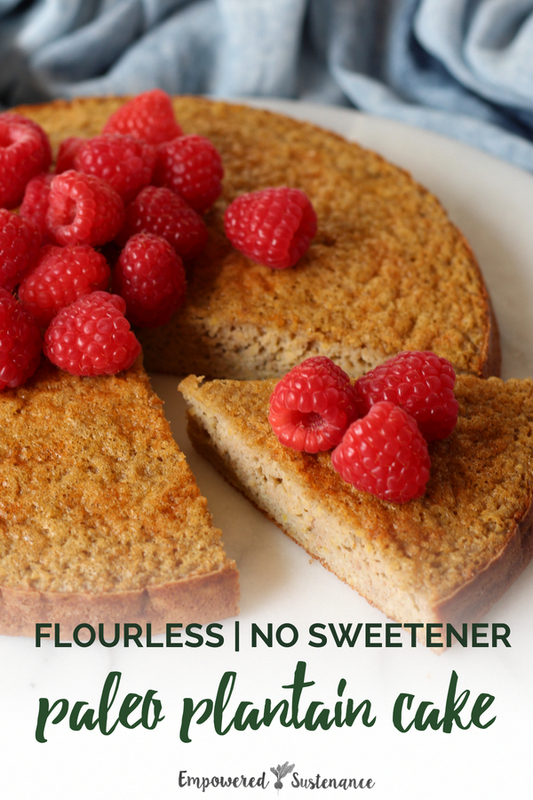 This easy plantain cake tastes like banana bread, but requires no sweetener or flour. Simply blend a handful of ingredients in a blender, bake, and enjoy. Preheat the oven to 350 degrees. Grease a 9" round cake pan with coconut oil. Place all ingredients in a high-powered blender (I use and recommend the Ninja blender). Blend until a smooth batter forms. Pour the batter in to the prepared pan. Bake for about 25 minutes, until a toothpick comes out of the cake moist but without crumbs. It is better to underbake rather than overbake. I prefer it slightly underbaked, when the texture is reminiscent of banana bread french toast. It's phenomenal. To serve, enjoy at warm or at room temperature, spread with ghee. Alternatively, let cool and serve with coconut whipped cream and fresh berries. Excellent recipe! Thank you so much.